As you can see I've been busily sewing Diaper Bags this week. 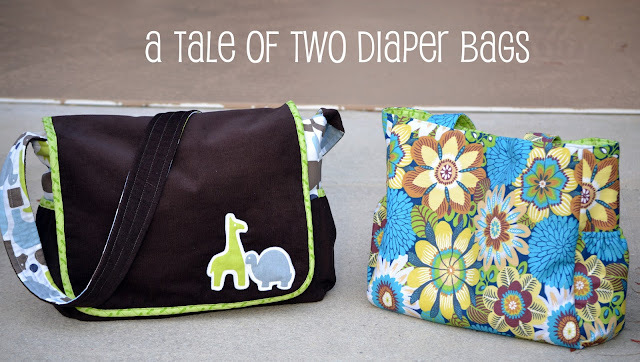 I have a friend whose daughter in law is having a baby and she wanted me to make not one but two diaper bags, one for herself and one for the new mom. I was a little nervous to make these because all the fancy pockets intimidate me. In the end I'm excited that I figured some of them out and learned some new things. I added side pockets with elastic tops as was requested. This is what it looks like inside, 2 large deep pockets on one side and 3 smaller ones on the other. I also put in a hidden zipper pouch. I am very excited this turned out well. It is not too hard at all...I think I may be adding a hidden zipper pocket to my bags more often. Sew Mama Sew has a good tutorial on this. For the next bag I morphed my mini messenger style bag into a much larger version. This one is made from small wale corduroy and Dwell Studio decorator weight fabric. It's lined with Osnaburg. The inside is the same as the other except with no zipper pocket. Again I added two side pockets, this time with a bias trim. I also added an extra-large pocket to the outside on the back with a velcro closure. One this one I put the zippered pocket on the outside in the front. All in all I'd say my diaper bag adventure, though a little daunting, was a success!! Hope they like them! Way to go, Sarah!! Both bags are darling. I'm sure the recipient will love them!! And, seriously how nice of you to make them TWO!!! Wow! All those pockets intimidate me. They look great! You are so talented...and inspiring! Beautiful work! Is there any way you can make this into a tutorial for both bags? They are SO adorable and definitely perfect for diaper bags for moms everywhere! Thank you all.. sadly no tutorial will be coming for these bags, there are plenty out there. 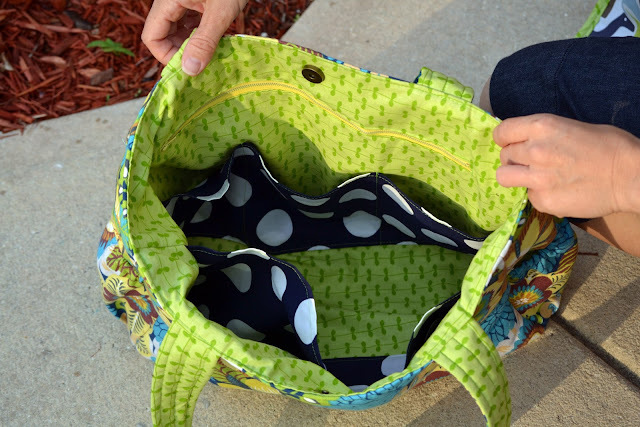 I may do a few mini tutorials on how to add a pocket to a bag in a variety of ways. I know that was the most intimidating part for me, but it really wasn't as hard as I was expecting.